The elbow does this other freaky thing, though. I mean, imagine if your knee did this. Pronation is when you turn your forearm so your palm faces down, and supination is when you turn your forearm so your palm faces up. Mimi Furst told me that the way she remembers this is, supination is how you would serve soup. Are you not freaked out by this? You can totally rotate your upper arm at the shoulder and your forearm at the elbow independently of each other! What makes this happen is the radius pivoting in the radioulnar joint. So you can also see the difference between a pivot joint and a ball and socket joint. A pivot joint just pivots on a single axis, a ball and socket joint moves in all directions. The little doodles are to show that supination is palms up and pronation is palms down. 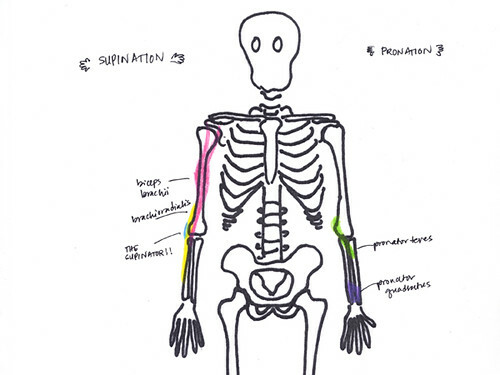 The muscles that pronate your forearm are your pronator teres and pronator quadratus. I think because they are more medially located, they turn your forearm in when they contract. The muscles that supinate your forearm are your biceps brachii, brachioradialis, and the monster truck of muscles, the supinator. These are more laterally located, so they turn your forearm out when they contract. Basically your pronator muscles can be exercised by doing resisted pronation, and your supinator muscles can be exercised by doing resisted supination. ...so if you were in plank position, your hands would be flat on the ground and the insides of your elbows would be facing forward. When you do pushups in this position, your elbows go back for a triceps pushup instead of winging out to the sides as in a wide arm pushup.